The company has been growing rapidly and Stephen aims to revolutionise the turf renovation industry with new machinery and ideas. 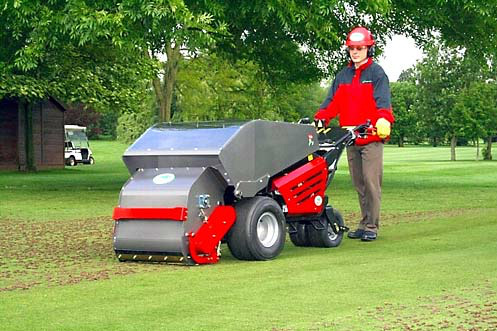 Their latest machine is the Groundmech Pedestrian Core Collector, which Renworx distributes from the UK. It allows the time consuming task of picking up the cores during greens renovation to be reduced by about half. A job that would normally take five or so guys about six hours, can now be done by two people in just three hours. Stephen said that they have had quite a few sceptics regarding the effectiveness of the machine, one of which was a superintendent at a golf course on the North Shore of Sydney, who initially didn’t think the machine would be able to get the job done. After demonstrating the machine to him, he had to admit the results were amazing! Although the Core Collector has been around in the UK for a while, Stephen says he had not yet seen it in Australia so he wanted to be the one to take the risk by ordering it. He first saw the machine on a Youtube video and without even knowing the cost, contacted the UK distributors and asked them to send one to him. He feels like despite the fact it was risky, it has definitely paid off in the end.